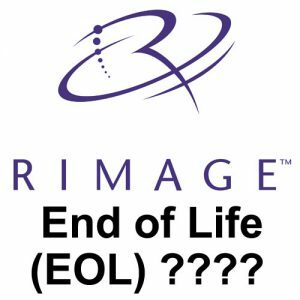 Have you been told your Rimage PrismPlus printer and/or duplicator is end of life (EOL) by Rimage? Maybe your printer/duplicator can’t be fixed, maybe spare parts are no longer available, maybe as a cost cutting measure they’ve eliminated anyone on staff that knows how to repair your Everest printer. One thing we know for certain – it means Rimage would like you to throw it away and buy a brand new one from them. They all have one thing in common, every one of the aforementioned excuses steer you towards costly capitol intensive purchases buying new and often unnecessary equipment. The cost on these Rimage Producer systems are roughly equivalent to shiny new car. Good thing there is no EOL in the vehicle segment I guess. We think it’s outrageous to scrap perfectly good disc producers. That’s why we’ve worked so hard to source replacement parts and train our employees so that we can extend the life of your equipment. If you need help, then give Techware a call to go over our cost effective Rimage repair options. We fix Everest II, Everest III, Everest 600, PrismPlus, and full systems like the 3400, 5400n, 7100n, 8100n, Amigo, 7200n and 8200n on a daily basis. Our goal is to show you real customer service and savings, period. After all, these Rimage machines are designed and made to run for 10 or more years. Let us help you with that. This entry was posted in Duplicators, Everest III Auto-printer, Rimage, Rimage Repair by Ryan Libson. Bookmark the permalink.